Blizzard has released the full color version of the cover art for the first issue of Sword of Justice, their upcoming, five-issue, Diablo III comic book. The project was announced last month during the SDCC, but we only got some concept art sketches at that point. Here’s the official blurb quoted from IGN; it adds a few details to what we already knew, and thanks go, as usual, to fmulder for the find. See the Sword of Justice DiabloWiki article for more details; basically the kid finds Tyrael’s supersword after Tyrael vanishes after shattering the Worldstone, teams up with a hottie female wizard, and adventure ensues. The release date for issue one (of five) is set for November 23, 2011.
if thats Tyraels sword that kids going to need about 60 more levels till he can use it. Normally I like to blame anime inspiration on the devs for WoW’s and D3’s ridicules item looks, but I gotta admit that that cover art looks closer to Diablo then D3 ever did. as far as cover art goes – this is an rather modest piece of art – dont get me wrong the lines are good but the detail ..
that quality is what i`d expect of the pages – but not for the cover – basically the cover is the most important part of the comic as far as marketing goes -which is the reason most covers are made by experienced illustrator rather than Comic book artist. Who writes this? if it’s Knaack I’m going to stay far away from it, his writing is awful. But yes, the cover art is actually quite nice. Author, artist, and other information is on the wiki page. Abit off topic but does anyone know if there is gonna be Legendary weapons in diablo 3 like world of warcraft? I’m thinking that this could be one of those weapons! Thought they were called unique in Diablo and not “Legendary” like WoW. But yeah i’m asking for the Legendary in WoW cause they were really hard to get. however i wouldnt bet anything on it – Blue people said that Rare items with good item level and good affix level will be potentially the best items in the game – but a perfect roll on desireable affixes are accordingly hard to get. whereas in WoW – they are no completely randomly generated items at all ( i think they are some for crafting ; however the rolls are fairly predictable – and even if you get a “perfect roll” for an crafted item – this item is still likely to be worse than 95% of the raidgear for the same slot. You are right I remember now the devs saying that rare items would be the strongest in game. Hopefully they add “legendary” items like wow in the future, that you need to do some crazy quest to get and craft. Is that Mike Mignola? I didn’t think he ever worked on anything other than Hellboy. I guess I can ask him next time he pops in to my local shop. 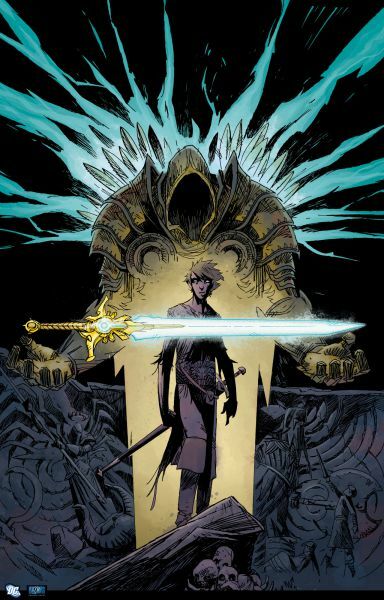 Sword of Justice is a five-part Diablo III comic by DC Comics, authored by Aaron Williams and illustrated by Joseph Lacroix. It will start selling in November 2011.